If you want to be able to consistently cast Benalish Marshal , you're going to have to make sure all of your lands tap for white mana. Unclaimed Territory & Godless Shrine can help with that. 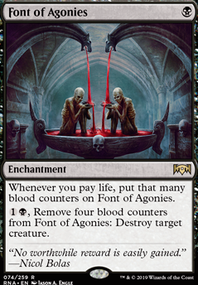 Since this will also make casting Murder more difficult, I'd replace it with Conclave Tribunal . I'd say it's an upgrade over Murder as it also helps you get the City's Blessing. Mortify is better than Murder as well. Midnight Reaper is probably the best Knight you don't currently have in your deck, I'd recommend finding room for him. For your sideboard; Ajani, Adversary of Tyrants & Arguel's Blood Fast Flip are good options for Control which will be a tough match up for you. Ripwater Thanks man! Can't wait till I'm home and can start working in this deck and make some of these changes! Super excited about them, and appreciate the suggestions as well and suggested cuts as I always find that's the hardest. And yup Archangel of Thune would be wicked just is always sold out at my LGS and I like to buy from them as much as possible. I live in a smaller city so cards don't come in to fast. As for cuts, Krav, the Unredeemed and Regna, the Redeemer I agree 100%. Was testing them out since I packed them but they are to expensive. 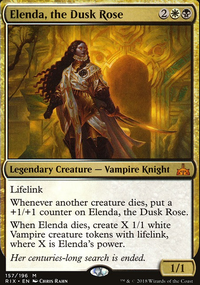 Rhox Faithmender was another experiment and honestly haven't tried him out yet but included him to help win cons like Test of Endurance but will be cut if I don't ever see him do work. 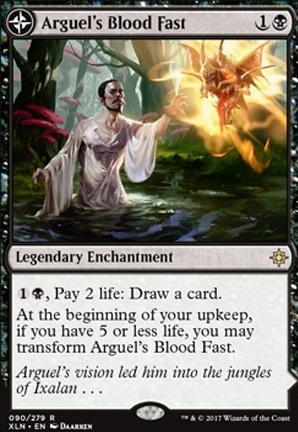 Again I didn't know of Arguel's Blood Fast Flip but will consider it though I do like the protection of Erebos, God of the Dead and don't often run into copy or steal effects in my play circles. Again in my circles there are alot of creatures (and not enough removal XD) and I have won many games clearing with Fumigate and just being at a ridiculous life total either with Atherflux Reservoir or Test of Endurance . And yeah will do man! Thanks! I'm happy my tips help, I can understand that some of the swords are harder to get a hold off, especially the expensive ones. 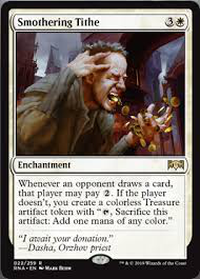 But do understand that there are more ways of giving Karlov evasion. Did you know the card Eight-and-a-Half-Tails ? I think you can pick it up for around 2 euro's or something and is not a highly played card, but it will perform well for Karlov. And if your LGS has Archangel of Thune that would also be one of the first cards I would pick up, since it's an alternate win con. 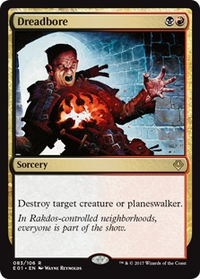 Rhox Faithmender He doesn't provide 2 triggers, just more lifegain. And thats not what we are after. Krav, the Unredeemed / Regna, the Redeemer They look good on paper, but cost an insane amount of mana. 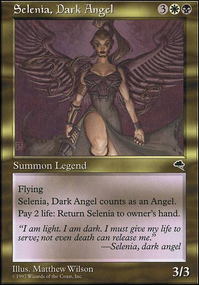 And lets face it you don't really run a lot of token generators other than Regna, to make Krav value. I've runned Regna without Krav for quite some time, but often I found that the 2 warriors I just didnt care for and the 6 mana for a 4/4 flyer is just a bit underwhelming. Erebos, God of the Dead Would swap him for Arguel's Blood Fast Flip. He is easily copied or taken over and that will impose an insane threath to your deck. Fumigate replace that one with Wrath of God / Damnation since you will probably whipe Karlov as well and that one mana can make a difference between whiping the board and passing the turn or whiping the board and rebuilding. I want to recommend a strategy my friend employs for abzan midrange. He uses the explore package with Merfolk Branchwalker , Jadelight Ranger , Seekers' Squire , and Wildgrowth Walker . 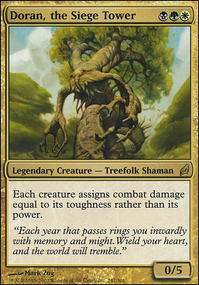 He has some more value creatures in the deck like Knight of Autumn , Izoni, Thousand-Eyed , Trostani Discordant , Llanowar Elves and Militia Bugler which is very good in that it picks up any creature in the deck. He has some Cast Down s and Mortify as well as Find / Finality . In the sideboard he has some more grindy cards like planeswalkers including Vivien Reid , Vraska, Golgari Queen , Karn, Scion of Urza . He has alternative removal in Assassin's Trophy and Ixalan's Binding For control he has some Duress , Arguel's Blood Fast Flip and Unbreakable Formation .